Featured Project - Al Frick's Slide In Gasifier - Projects - Drive On Wood! 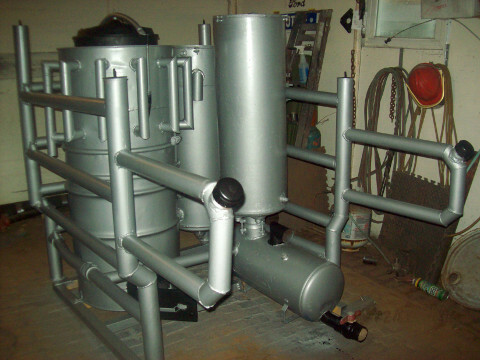 Featured Project of the Month for June 2015 is Al Frick’s slide in gasifier. Al has come up with a clever arrangement for his upcoming woodgas truck - a slide in unit! With no permanent attachment to the vehicle, he can easily move it to a different truck whenever he likes. Al, if you could update us on the status of your gasifier, maybe post some new photos and a walkaround video below, we’d be grateful. Great work on this project! Now if you could mass produce 5 or 10 of them you would never have too retire.I like that idea /That is some nice fab work. Excelent!!! I was lookig forward for a project like this for my CJ-10 Jeep. I´ll post pictures soon. Congrats!!! Awesome idea, very clean looking too. Good to know, just comparing that to the Dakota, a lot more flexibility with vehicle choice. Now just like Kevin said, make 5 or 10 of them and you’re set.